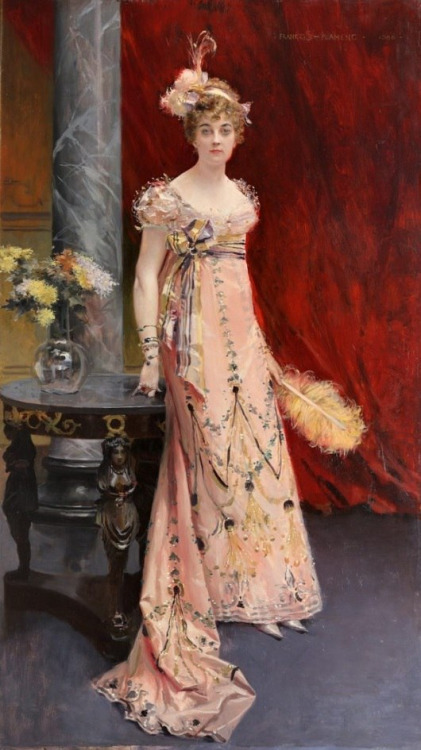 Daria de Beauharnais, Countess of Leuchtenburg was born on 19 March 1870 at St. Petersburg, Russia. She was the daughter of Eugene von Leuchtenberg and Daria Opotchinina. She married, firstly, Prince Leon Kotchoubey on 7 September 1893. She and Prince Leon Kotchoubey were divorced in 1911. She married, secondly, Waldemar Baron von Gravenitz on 22 February 1911 at St. Petersburg, Russia. She died after 1930 at St. Petersburg, Russia. From 7 September 1893, her married name became Kotchoubey. From 22 February 1911, her married name became von Gravenitz. She married thirdly an Italian Marchese, and fourthly an Spaniard. Countess Daria Dmitrievna Beauharnais von Leuchtenberg, great-granddaughter of Emperor Nicholas I, was a member of the wider circle of Russian Imperial family. Born in 1870, she was nicknamed Dolly. In 1893 she married Prince Lev Mikhailovich Kotchoubey, and as Princess Kotchoubey Dolly was immortalized by a French artist Francois Flameng in the portrait above. According to some reports Dolly was banished from Russia in 1905 for being very vocal about her criticism of the Tsar and his wife, and she lived in France until 1911, when she was allowed to return. Wasting no time she divorced, leaving her husband and children, and opening doors to a new love. According to a romantic story she told: “Once, when she was sailing abroad in the company of her chaperon, a battleship under the command of Captain Vladimir E. Grävenitz (1872-1916) passed by sailing in the opposite direction. The captain noticed Dolly through his binoculars and, amazed by her beauty, he signalled the steamship to halt, took a boat, came aboard to introduce himself, and finally kidnapped Dolly right from under the nose of the latter´s chaperon.” Truth or not, Dolly married this man in 1912, unfortunatelly, because of professional fall from grace he commited suicide. At the time of 1917 revolution Dolly was at the front, organizing medical help to Russian soldiers. Upon the news from the capital she went to Bavaria, only to inexplicably return back to Russia, taking a name “Dora Leuchtenberg”. When asked about her political standing, she replied on a work application form: “… non-party, though of the political parties she sympathises with the Russian Communist Party, which is why, after the revolution in Germany, she remained in Russia.” Whatever her dreams for the future, she certainly did not expect to be moved out of her comfortable flat with almost nothing, laying unconscious on the pavement, until a kind man gave her a coat before she froze to death , and finding herself completely without money. The kind man who had taken pity on her was named Victor Alexandrovich Markezetti. Before a year passed, Dolly married him. In fact Dolly´s initial favouritism of Communism quickly vanished and as the year passed by her hatred for it grew. It is possible she was involved in a counterespionage plot, perhaps working as a double agent. Unfortunately the events of her life in the 20s and 30s remain obscure. In 1937 she and her husband were arrested by KGB and interrogated for months. Dolly confessed to everything she had been charged with, the final papers of the confession bearing a signature of 67-years-old, broken woman. She admitted all,: that her husband was a member of Gestapo, that she was a part of German terrorist organization, , that she was involved in assassination plots against Soviet politicians, that she held secret counterrevolutionary meetings and was hiding foreign agents in her flat. On October 29th she was sentenced to death and shot less than a week later.